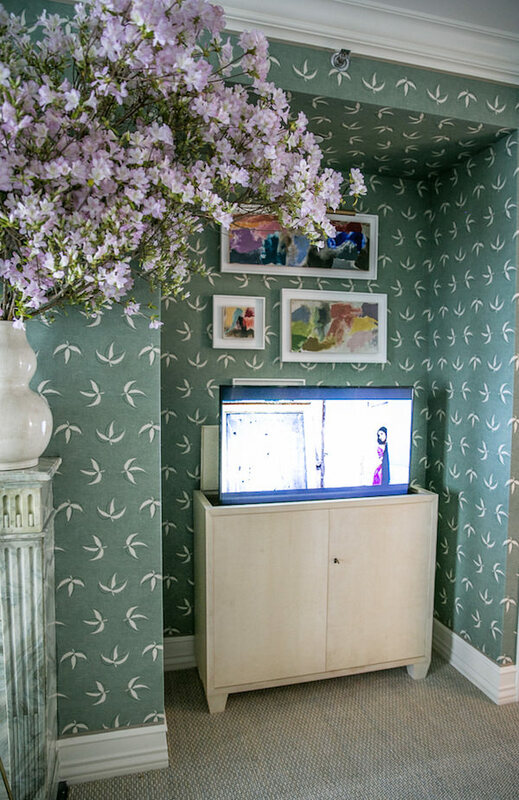 I have been tracking Catherine Olasky and Max Sinsteden of Olasky & Sinsteden ever since spying their stylish Sotheby’s Showhouse drawing room a couple of years ago. Young designers with pedigreed pasts (aka design experience), they draw on the classics to create fresh new interpretations of tradition. 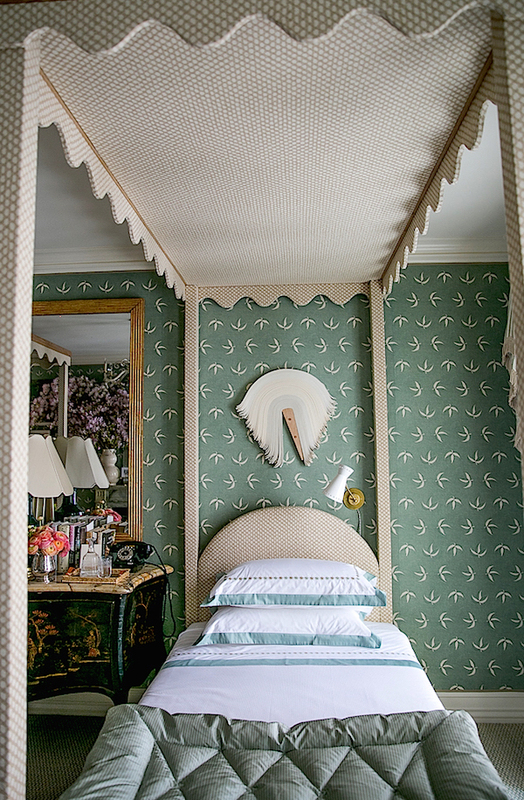 Their Kips Bay guest bedroom is just that – a chic modern spin on what might have been a top floor space in a stately home. 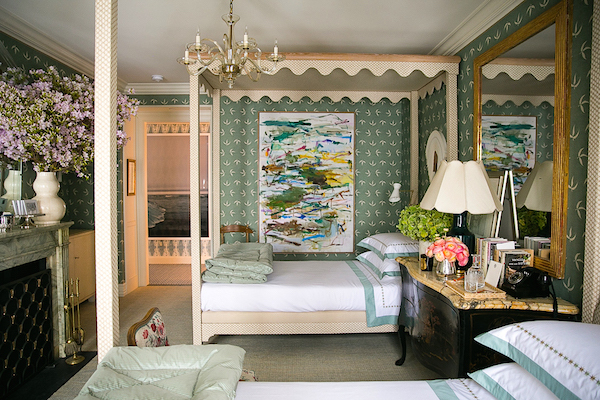 The beds are custom designs that nod to the past with comfort, practicality and updated style. Scalloped tops are reminiscent of a classic tester, yet they feel airy and open with flat upholstered surfaces in a small custom cotton print from Fermoie in lieu of endless yards of hanging fabric. Practicality comes into play as top and feet are edged with a pale cerused wood, making dusting and vacuuming easier chores. 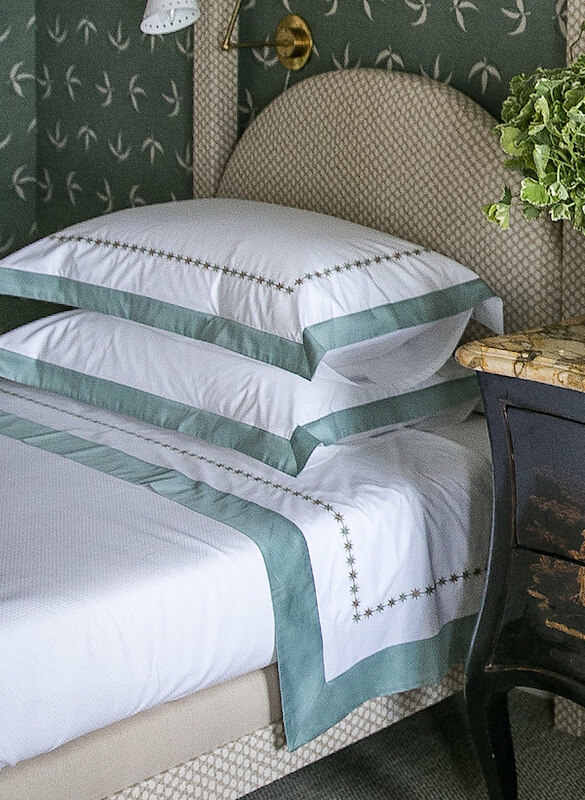 And while they have the appearance of classic twins, the beds are actually thirteen inches longer and six inches wider with beautiful custom linens from Nancy Stanley Waud – a spacious and luxurious treat for weekend guests. 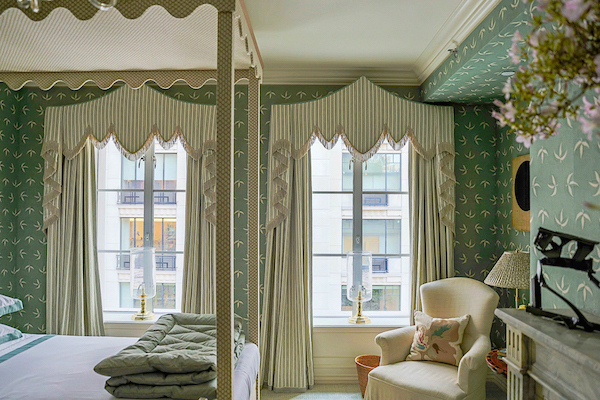 A classic John Fowler curtain design was adapted and updated both for a fresh look and to stylishly accommodate the soffit. 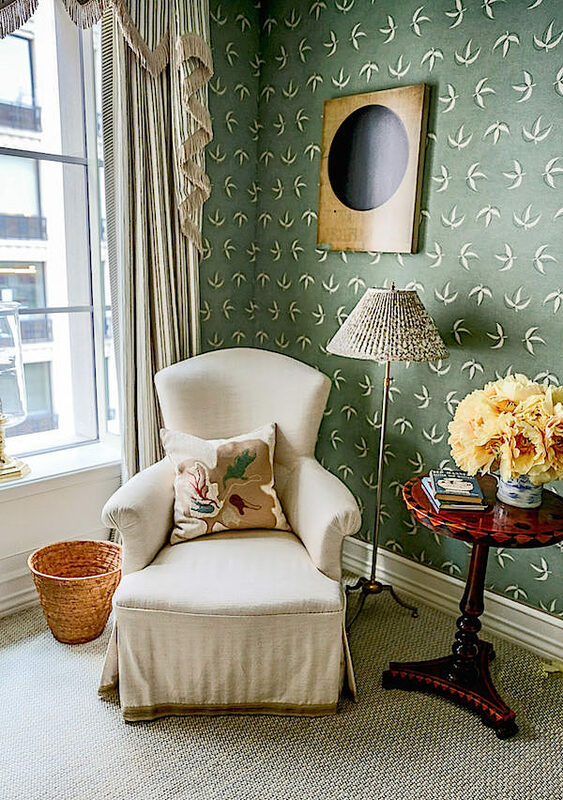 Curtains and upholstered walls, as well as the other fabrics are from the newly released Warner Textile Archive Collection available through Claremont. mix effortlessly with contemporary art such as a fabulous large work on paper I covet by Kikuo Saito (top photo) and the vinyl art of Denver artist Derrick Velasquez, below, sourced by art consultant Illa Gaunt. 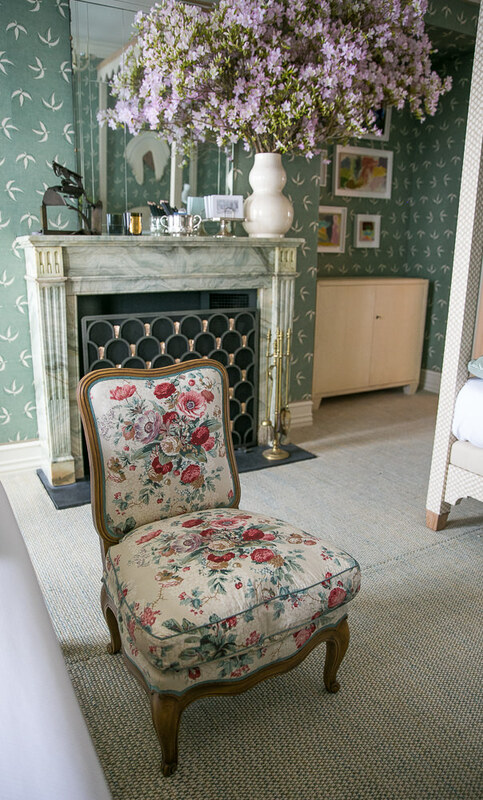 Of course the ideal guest bedroom has its own fireplace, enhanced with an antique mantel from A & R Asta and stunning floral arrangement from Helena Lehane. Schumacher‘s fetching Frances slipper chair is oozing with timeless charm in Eleanor, an 1860’s chintz reprinted with the same traditional hand screened methods as the original for the Warner Archive collection. 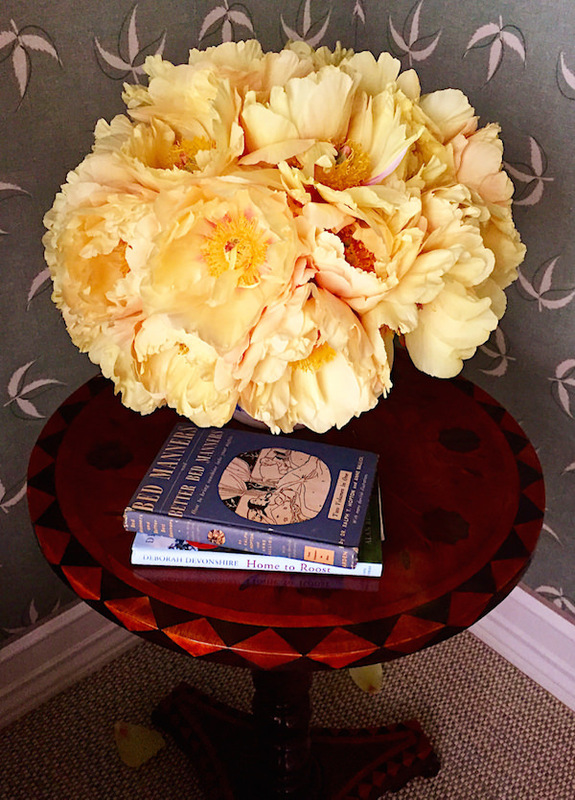 and a gorgeous bouquet of Chinese tree peonies by Helena Lehane. 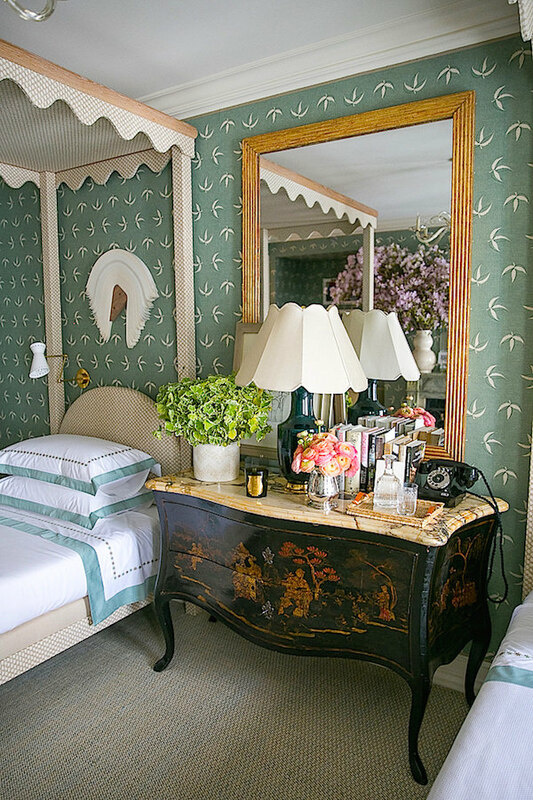 Christopher Spitzmiller‘s Ming Lamp, in my favorite shade of prussian blue, with a graceful custom shade from Blanche Field, anchors an assemblage of stylish bedside necessities. This entry posted in art, design, furniture, interior design. 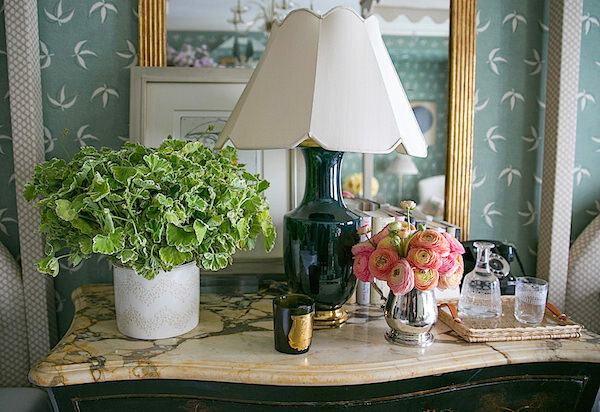 Entry Tags: interior design, Kips Bay, Kips Bay decorator show house, Kips Bay Show house, Olasky & Sinsteden Bookmark the permalink. Absolutely beautiful. Lots of good ideas to work with. Thank you, Stacey. The floral arrangements are particularly lovely. Can you tell me what O & S used on the floors? PS I watch The Leopard once a year. Timeless. Love the mixture of colors, patterns and styles. And covet that chinoiserie chest. I’m going tomorrow and I so interested to see this space. Some this about the Derrek Velasquez art against the Claremont print gets me every time I see it. Thanks for the sneak peek! This is so beautiful and absolutely one of my favorites. So glad to know about these young designers! LOVE this post! A very nice room in a houseful of spectacularly uninteresting design rooms. Kips Bay was a disappointment this year, but this room is a bright spot. Especially love the John Fowler adaptation window treatments. And I’m a big fan of Christopher Spitzmiller’s designs. In fact, I just spoke to him on Sunday at Carolyne Roehm’s house during the wonderful Trade Secrets garden tour in Sharon. We share a mutual enjoyment of the auctions at Stair Galleries. Christopher is always the gentleman. I am always interested in the projects I see from these two designers. Thank you for sharing in such great detail. I love the sleek design of the television cabinet and am fixated on the expanded size twin beds – an idea I would like to copy in our summer place where the guest room occasionally needs to accommodate a couple (rather than just my girls’ friends). I think it would be much more comfortable – particularly for husbands. Lots of sensible ideas to figure with. Thank you, Stacey. The floral arrangements are notably pretty. Can you tell Pine Tree State what O & S used on the floors?i am watch The Leopard once a year. Timeless. Outstanding! Love the color. Perfect green, great patterns! So dreamy and inspirational. Thank you. 80 queries in 0.736 seconds.